Mads Vassar Blog: Shiva Rave Returns This Friday! 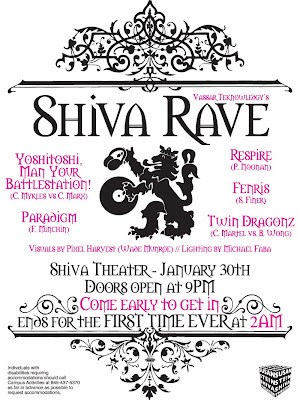 This semester's Shiva Rave hosted by VT is coming up this weekend! Plus, for the first time ever, the rave will be going until 2am. Space is limited and the line was out the door last semester, so be sure to show up early. The night also features visuals by VJ Pixel Harvest and lighting by Michael Faba. Friday (1/30), Shiva Theatre, 9pm-2am. More info to come throughout the week.